He used to ride a bicycle, or sometimes even walk, all the way from Gopalapatnam to the Dwaraka Bus Station (RTC Complex), about 15 km away, to buy the Sunday edition of an erstwhile English daily, which used to carry an article by noted cartoonist Sridhar. He set out with an ambition to become a full-time political cartoonist, but lack of opportunities made him foray into new areas, while retaining his forte. 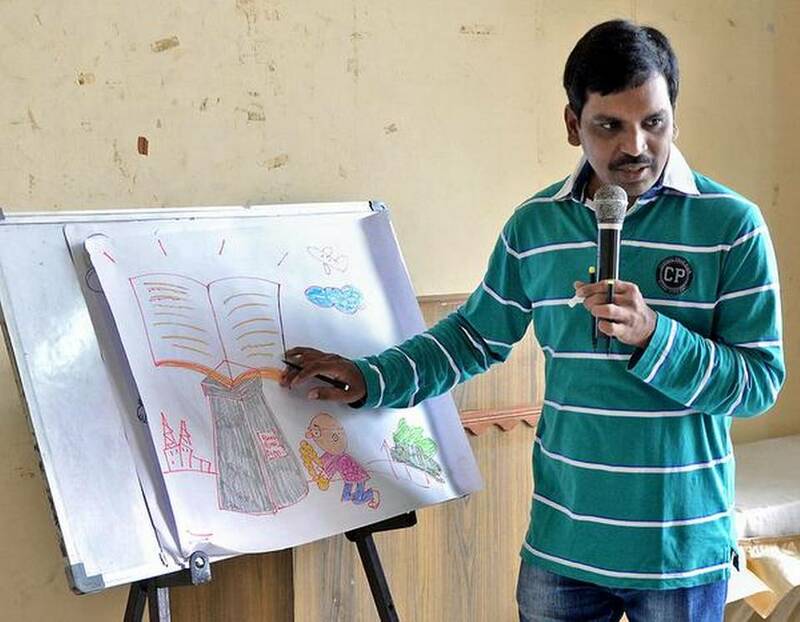 He is B. Hari Venkata Ramana, popularly known as ‘Cartoonist Hari’, of Visakhapatnam. He carved a niche for himself as a state-wide resource person to teach schoolchildren in drawing cartoons and use them as a strong communication tool to express themselves. He used to spend more time in sketching rather than studies. He understood the ground reality only when the time came for him to choose a career. My joy knew no bounds, when my first cartoon was published in the popular Telugu daily Andhra Prabha, and I received ₹100 for it. That was nearly 25 years ago and I was studying in Intermediate. It was a lot of pocket money for me, he said recalling the happy days. After completing my B. Com, I went to Hyderabad, in the hope of finding a job. I worked for a few Telugu weeklies and evening dailies as a freelancer. I cherish meeting Mr. Sridhar on three occasions. It did not take long for me to realise that there were not many openings in big media houses and the small newspapers do not pay adequately. In 2001, I switched over to 2 D animation and later diversified further into making documentaries, flip books, designing IEC (Information, Education and Communication) materials, apart from cartoons and animation, he says. His political cartoons are regularly carried in the Telugu daily Visalandhra even now. He also received Presidents Award from the Ministry of Youth Affairs in the field of services to community, in the year 2014.